How Do Today’s Mothers and Fathers Rate Themselves as Parents? In spite of the challenges they face, today’s parents give themselves good grades overall for the job they are doing raising their children. Among all parents with children under age 18, 24% say they are doing an excellent job, and an additional 45% say they are doing a very good job. Some 24% say they are doing a good job, and only 6% say they are doing a fair or poor job as parents. Mothers give themselves somewhat higher grades than do fathers: 73% of mothers with children under age 18 say they are doing an excellent or very good job as a parent, compared with 64% of fathers. Married parents with children younger than 18 give themselves higher ratings than do unmarried parents. Some 72% of married parents say they are doing an excellent or very good job raising their children, compared with 63% of unmarried parents. Among mothers, those who are working give themselves particularly high ratings—78% of working moms say they are doing an excellent or good job raising their children. Among non-working mothers, 66% say the same. Whether parents feel they spend enough time with their children has a big impact on how they evaluate their parenting. Parents who think they spend the right amount of time with their children are about three times as likely as parents who say they spend too little time with their children to say they are doing an excellent job parenting (30% vs. 11%). 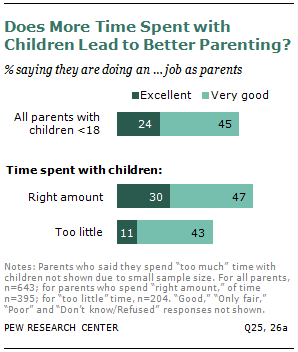 Overall, 77% of parents who say they spend the right amount of time with their kids also say they are doing an excellent or very good job as parents; only 54% of those who say they spend too little time rate themselves as doing an excellent or very good job. Similarly, parents who say they have difficulty balancing work and family life are harder on themselves when it comes to evaluating their parenting. Among working parents who say balancing the responsibilities of their job and their family is difficult for them, two-thirds give themselves an excellent or very good rating for the job they are doing as parents. By contrast, among working parents who say balancing these responsibilities is not difficult for them, 77% give themselves high marks. Education is also linked to parents’ self-assessments. Among parents with children under age 18, those who have attended or graduated from college rate their parenting more favorably than those who have not attended college: 73% of parents with some college experience say they are doing an excellent or very good job as parents, compared with 63% of those with no college experience. The stresses and joys of parenthood are inextricably linked to overall happiness and well-being. It is nearly impossible, using survey data alone, to disaggregate the factors that contribute to happiness. However, some interesting patterns emerge relating to work and family life. In general, adults with children of any age tend to be somewhat happier than those who do not have children.12 Three-in-ten parents (31%) say they are “very happy,” 48% say they are “pretty happy” and 17% say they are “not too happy.” Among adults with no children, 24% say they are very happy, 60% say they are pretty happy and 14% say they are not too happy. Among parents with children under age 18, mothers (36%) and fathers (30%) report roughly equal levels of happiness. However, a slightly larger share of fathers than mothers say they are not too happy (17% vs. 11%). Married parents are happier than unmarried parents (38% vs. 23% say they are very happy). There is a significant gap in happiness between married and unmarried mothers. Among married mothers with children under age 18, 43% say they are very happy with their life overall. By contrast, only 23% of unmarried mothers say they are very happy. There is also a gap in happiness between working and non-working mothers. While 45% of mothers who do not work are very happy with their life, only 31% of working mothers say they are very happy. While parenthood can be a source of great happiness, the stresses and strains of balancing work and family life may have an impact on overall well-being. Working parents who say they find it difficult to manage the responsibilities of their job and their family are somewhat less happy overall than those who don’t have difficulty balancing these things. Only 26% of those who say it’s difficult for them to balance work and family say they are very happy, compared with 36% of those who don’t have difficulty balancing. Similarly, parents who say they do not spend enough time with their children are less happy than those who say they spend the right amount of time with their children. Among those parents who say they spend too little time with their children, 26% say they are very happy overall. This compares with 36% of those who say they spend the right amount of time with their children.